It’s a fresh new year and the start of 2015, so we at Flaunt would encourage you to get your existential crisis out of the way early—particularly since Haruki Murakami is on hand to doll out some (doubtless) surreal advice for placating your meta afflictions. The Japanese literary supremo will be playing Agony Aunt via his website and ‘will receive questions of any kind.’ As the man himself once put it; ‘If there is a hard, high wall and an egg that breaks against it, no matter how right the wall or how wrong the egg, I will stand on the side of the egg.’ Perfect for the omelette in all of us. If only all art was life imitating art imitating Michael J. Fox. 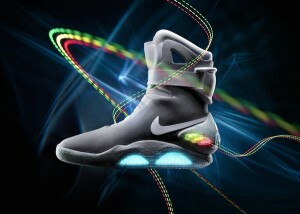 Nike have one-upped splitting the atom by making the actual shoes from Back to the Future. That’s right, these puppies will lace themselves via patented technology that involves a series of rollers, an electric motor and some self-replicating nanobots. Cherish your shoelaces the next time they come undone, and realize that your grandchildren won’t have the faintest idea of how to tie them. Mind controlled robot arms. Yup, that’s right–‘Mind controlled robot arms’. That’s probably the most futuristic sentence since that guy (we presume they’re a guy) said ‘I’m dedicating my blog to lazertits.’ In a truly astonishing essay in design, the John Hopkins Applied Physics Laboratory have combined advanced nerve surgery, highly evolved pattern recognition software and robotics to provide a bilateral, shoulder-level, double amputee with the capacity to manipulate a new set of robotic limbs. In another bold realization of our arrival in the future, architectural collective Coop Himmelb(l)au’s stunning Musée des Confluenceshas just opened in Lyon France. The new museum celebrates science and anthropology with three inaugural exhibitions asking ‘where we come from?’, ‘who we are?’, and ‘what we do?’ We are not-so-secretly hoping that they might do like us, and pursue Murakami for some answers to these questions. Unless you’re like Flaunt and sleep naked every night in a bed of Mink blankets, fur is probably a fascinating subject of tactile delight and/or moral revulsion. The National Museum in Copenhagen is considering aesthetics, ethics and utility with a major exhibition on fur. On Flaunt radio this week we’ve been listening to Room 302 Feat. Tink by electro supergroup Future Brown. For her 19 years, Timbaland apprentice Tink is demonstrating some serious talent. We’ve got our eye on her and you should too. Flaunt has long stuck to the following definition of a Gentleman: a man who can play the piano accordion—but doesn’t. Yet in deference to a veritable coup-for-concertinas, we’re still drooling over this Wave Cabinet by Sebastian Errazuriz that unfolds like an accordion. It was shown at Design Miami by Cristina Grajales Galleries. Tomorrow night Steve Turner Gallery is opening its new space in Los Angeles with its first exhibition: Space Program. The new gallery is situated in a 1920’s concrete warehouse and will be showing works by Yung Jake (friend of Flaunt who featured in Flaunt 130: The Stakes Issue) and ascending digital artist Rafaël Rozendaal—both of whom are coming off the back of some strong performances at Art Basel. 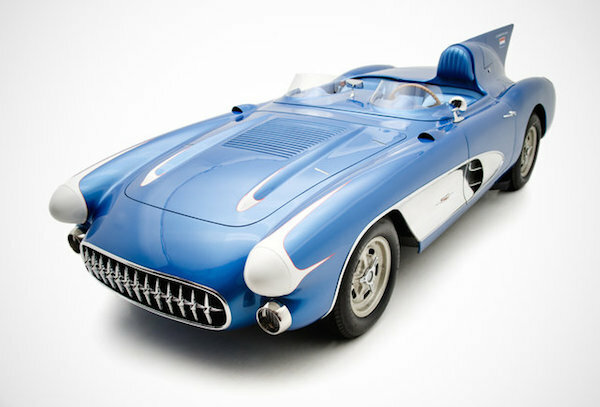 From Back to the Future, Fast Forward to the Past with this truly delicious 1956 Corvette that’s up for sale. This is the first time this racing model has ever been available to the general public. There’s a cocktail reception for interested buyers on the 14th of this month. Space Jam is arguably the greatest ever piece of basketball cinema next to Air Bud. In an audacious and unbridled artistic vision, artist Devon Struther has constructed an entire solo exhibition around the 1996 Michael Jordan and Bugs Bunny masterpiece. Space Jam runs from tomorrow until February 14th at Marlborough Chelsea in London. It’s always nice to hear about the success of intrepid drinking endeavors that almost go up in smoke. After an explosion and a fire at Tuthilltown Distillery in Gardiner New York, the labels of the various batches of whiskey were reduced to cinders inside the otherwise uninjured barrels. Set aside and aged, they have been blended into Hudson Double Charred Whiskey. A smoky drop with a smoky story. The Museum of New Art in Tasmania Australia will be celebrating their 7th annual Festival of Music and Art (or MOFO according to its moderately inaccurate acronym). This year it’s curated by Brian Ritchie of the Violent Femmes and includes musical performances by Swan, the smashing of 250 hammers by Chinese performance artist Li Binyuan (we presume with…a hammer? ), the Exxopolis inflatable art city by Architects of Air (pictured above), and what may well be the most obnoxious sounding musical performance in all of history—a participatory smartphone orchestra. For those of you who have long since concluded that the augur of Doomsday will be the sound of a trillion text messages erupting in a polyphonic cocophony, we think it’s best that you start prepping your fallout shelter.